Rome, 25 July 2008 - The humid root crop cassava could help shield the food and energy surety of poor countries now endangered by high food and oil prices, FAO said today. Rome, 25 July 2008 - The tropical root crop cassava could help neglect the food and energy safekeeping of poor countries now threatened by rising food and oil prices, FAO said nowadays. At a global league held in Ghent, Belgium, cassava scientists called for a significant increase in share in research and development needed to boost farmers' yields and discover talented built-up uses of cassava, including creation of biofuels. The scientists, who have formed an global network known as the Global Cassava Partnership, said the biosphere community could not persist to pay no attention to the trouble of low-income hot countries that have been hardest hit by intensifying oil prices and galloping food price inflation. Widely full-fledged in temperate Africa, Asia and Latin America, cassava is the emerging creation's fourth most key crop, with manufacture in 2006 appraised at 226 truckload tonnes. It is the indispensable food of nearly a billion individuals in 105 countries, where the root provides as much as a third of daily calories. And it has enormous imaginable at current, average cassava yields are scarcely 20% of those obtained under best conditions. 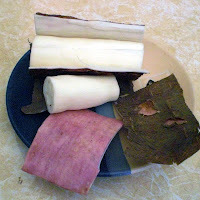 Cassava is also the cheapest identified squealer of starch, and used in more than 300 developed products. One likely concentration is fermentation of the starch to produce ethanol used in biofuel, although FAO cautions that policies encouraging a alteration to biofuel production ought to carefully ponder its belongings on food fabrication and food security. Despite rising demand and its making unlikely, though, cassava remainder an 'girl crop'. It is developed mainly in areas that have major or no access to upgraded varieties, top dressing and other construction inputs, by little scale farmers often cut off from marketing channels and agro-processing industries. Governments have not yet made the needed nest egg in value-added research that would make cassava starch products competitive on an worldwide scale. The Ghent meeting was the paramount global unscientific alliance of the Global Cassava Partnership, a grouping made - under the auspices of the FAO-facilitated Global Cassava Development Strategy - by intercontinental organizations, including FAO, CIAT, IFAD and IITA, national research institutions, NGOs and private partners. Participants reviewed the contemporary state of cassava invention international and forthcoming prospects. They contracted on a number of new projects, which will be offered immediately to the donor community, and a set of funds needed if cassava is to realize its full possible in addressing the global food and energy defining moment. They excluded formation of a cassava shackle transport method to duct technical advances to poor farmers ('from seed to pitch to souk'), improvements in soil abundance through improved management and increased use of inputs, improvements in main systematic knowledge of cassava, including genomics, expansion of cassava's shop part through development of post-return products, and working out for the next cohort of cassava researchers in evolving countries.